The No Barriers Foundation has recently started to work with schools in Guyana, South America. 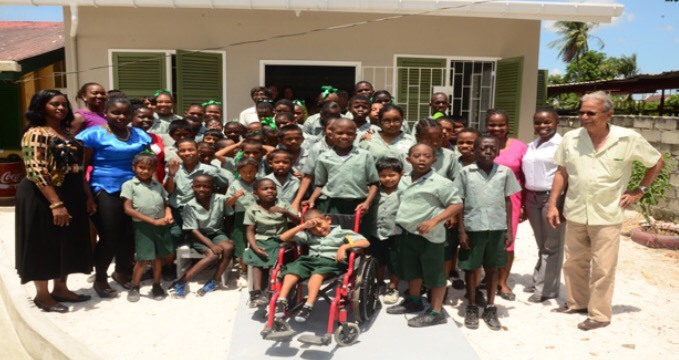 Diamond Special Needs School is one of these schools; the age of the pupils ranges from 5-21 as Principal Wendy Grimmond-Webster can’t turn 16 year olds away when parents ask what will happen to them. Pupils at this school exhibit a range of needs from speech impairments, deafness, Down Syndrome, visual impairment along with other learning difficulties, and as such, are often ostracized by the wider community due to limited understanding. We are looking to support Diamond School in any way we can. So far, we have sent around two hundred children’s books along with reading aids for some of the visually impaired children. Our next quest is to develop the school’s creative curriculum. If inclusion is our goal for all our students, art and craft need to be a high priority. Every child has the right to explore and experiment a range of creative avenues. Not only can the arts provide the necessary skills for students to express themselves, but good art programmes can also lead to possible jobs in the art industry, which for the students of Diamond School, is invaluable. For this reason, Diamond School have established a creative classroom space within their school, however lack the resources and teaching staff to utilise it. The No Barriers Foundation are determined to change this, by providing the school with all the art and craft resources they require for their students to truly blossom. As such, we are asking for any arts and crafts donations, no matter how big or small, to send to Diamond School. These may include but aren’t limited to: paints, brushes, printing materials, pastels, paper, crayons etc. If you believe you can support us in any way, please email [email protected]nobarriersfoundation.org, tweet as at @NoBarriersFdn or message us on Facebook.